The program allows you to add, edit and view documents. Choose the Category in which you want to add your documents. Then click on the Add item button on the upper right side of the program. The new window is used to define the following elements: Brief - a short description of what the element we are adding concerns, Keywords - we enter keywords concerning documents. The file path is then defined in the File fields. Select a file by clicking on the Browse file... button, to delete it click next to the field on the Delete button. After completing the fields, click on the Add new item button. We have just added a new element. Choose the Category where the document to be edited is located. Click once on the document. Click on the Edit item button at the top right of the screen. The new window is used to improve the following elements: Brief - a short description of what the element we are editing concerns, Keywords - we enter keywords concerning documents. The file path is then defined in the File fields. Select a file by clicking on the Browse file... button, to delete it click next to the field on the Delete button. When we select a new file, the old one will be deleted. When you have finished filling in the fields, click on the Update item button. This item has been changed. Select the Category where you want to delete the document. Click once on the document. Click on the Delete item button on the upper right side of the program. The program will ask you if you want to delete the item. Click on the Yes button and the document will be deleted. All documents deleted by us are available in the Trash folder from which they can be restored or permanently deleted. 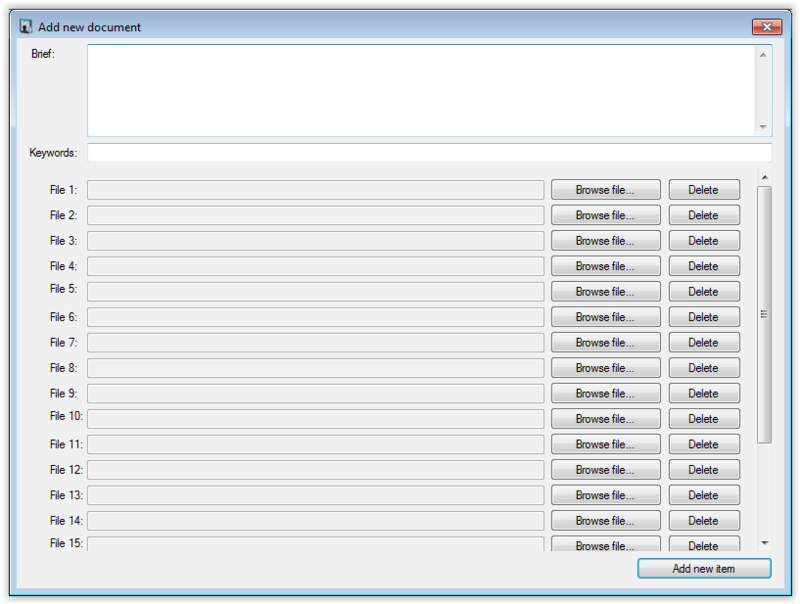 On the left side of the program select the Category for which you want to view documents. Then in the right part you will find the elements matching the category. Now click on the item twice. A window with a preview will appear. The Brief field contains a brief description, the Keywords field contains keywords assigned to this document. Then there are the Created date and the Updated date of the last update. Below is a list of files attached to the document. Double-clicking on a file opens it. From the window you can edit the document by clicking the Edit button or you can close the window by clicking the Close button.